The Underbelly Squizzy series, screened on Channel 9 from July to September 2013, has revived interest in Melbourne's notorious gangster Joseph Leslie Theodore "Squizzy" Taylor. Here we examine some of the facts and fiction about Squizzy's life and death. Squizzy Taylor's shooting in Carlton and subsequent death at St Vincent's Hospital in Fitzroy on Thursday 27 October 1927 was reported nationally in newspapers the following day, Friday 28 October. However, some interstate newspapers reported the day incorrectly as Wednesday. One notable author, Hugh Anderson, has an incorrect date of 26 October 1927 in his book The rise and fall of Squizzy Taylor : A larrikin crook. A more recent publication, Gangland Melbourne, gives a fictitious address of "Barkly Street Fitzroy" for the shooting scene. 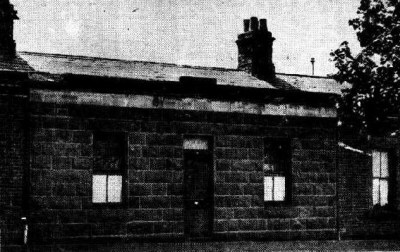 The house at 50 Barkly Street Carlton no longer exists, but a photograph published in the Chronicle in November 1927 shows a double-fronted bluestone cottage, with adjoining brick buildings. The five cottages comprising Barkly Terrace were built in 1862, on land owned by Carlton builder Christopher Glynn. The cottages had several changes of ownership in the 19th century - Abraham Levy (1868), John Rainer (1874) and William Michel (1882). As rental properties, they became run down and were described as "old and always being repaired" in William Michel's probate file of 1895. At the time of the shooting in October 1927, Barkly Terrace was owned by Alfred Abraham Solomon. Bridget Delia Cutmore, mother of Squizzy's rival John Daniel 'Snowy' Cutmore, had lived there since 1919 and offered rooms for board. She stayed on at Barkly Terrace, the place where her son died and she herself had been shot, until her own death in 1938. Barkly Terrace changed ownership two years later in 1940, from the executors of Alfred Solomon's estate to members of the Labattaglia family. In an ironic twist, Francesco Antonio (Frank Anthony) Labattaglia was the third husband of Squizzy's widow Ida Pender. They married in 1933, after Ida divorced her second husband George Lewin (aka Mickey Powell) in 1932, on the grounds of desertion. Barkly Terrace survived its first hundred years, then it was placed under a Housing Commission order in 1963 and demolished in 1965. The "sombre bluestone house", as described in The Sun in 1927, was replaced by a block of flats. A stone lintel salvaged from the demolition site remains a silent witness to the events of 27 October 1927. Film maker Nigel Buesst, who lived in Barkly Street in the 1960s, included images of the partly-demolished Barkly Terrace in his 1969 documentary The Rise and Fall of Squizzy Taylor. The house with the picket fence, screened in the final episode of Underbelly Squizzy, bears no resemblance to the "sombre bluestone house" of Barkly Terrace, and the street number is incorrect. In the 1982 feature film Squizzy Taylor, directed by Roger Simpson and Roger Le Mesurier, the shooting scene was filmed in Macarthur Place, Carlton, just around the corner from the building that once housed the surgery of doctors Frank Hobill Cole and Alan McCutcheon. 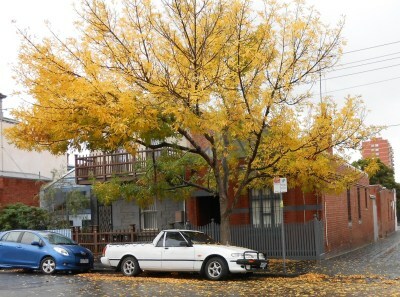 The hire car driver John Hall was the only person to follow Squizzy's last journey, from its start outside the Bookmakers Club in Lonsdale Street Melbourne to the finish at St Vincent's Hospital Fitzroy. As a resident of Carlton and a hire car driver, he would be expected to be familiar with the area and know local landmarks such as hotels. But in his evidence to the Cutmore/Taylor inquest, Hall did not name the hotels visited by Squizzy, and he was vague about the identity of the two men who accompanied him on the journey. Was he leaned on to forget what he saw? John Hall lived at 12 Murchison Street, not far from the shooting scene at Barkly Terrace. According to Sands & McDougall and Victorian Electoral Rolls, he lived at Murchison Street from 1927 to 1928 only. Squizzy had two daughters from his marriage to Lorna Kelly and one to Ida Pender, born before they were married. Lorna made it down the aisle just in time - she married Squizzy in May 1920 and their first child June was born in June 1920. Sadly, June died on 9 January 1921, aged 7 months, at her maternal grandparents' house in McCracken Street Kensington. According to her death registration (no. 2138, 1921) and the diagnosis of Dr Sutherland, the cause of death was "indigestion" and not Spanish influenza, and she did not die in hospital, as depicted in Underbelly Squizzy. Lorna and Squizzy's second daughter, Leslie (Lesley), was 5 years old at the time of Squizzy's death in 1927. His death registration (no. 15358, 1927) states "no issue" from his second marriage to Ida Pender, which may have been technically correct because the child was born out of wedlock. The baby arrived at an inconvenient time in February 1924, when Ida was due to appear as a material witness for the defence in a trial involving Squizzy. The trial was postponed for one month, with some newspaper accounts referring to Ida's "delicate state of health", while others were more forthright. The Daily Standard of 25 February 1924 reported that Ida Pender had given birth on 15 February and was still in a very week state of health. Squizzy married Ida in May 1924, just after his divorce from Lorna was granted. Lorna petitioned for divorce in July 1923, after 3 years of marriage to Squizzy Taylor, on the grounds of repeated misconduct with Ida Pender. In her sworn affidavit, Lorna stated that her husband Theodore Joseph Lestor Taylor was born on 29 June 1887, a year before his birth was officially registered. She further stated that their daughter June was born in June 1921 and died in January 1922, a year after the birth and death records were officially registered. How could she get such significant dates wrong? Lorna was granted a decree nisi in February 1924 and the order nisi was made absolute in May 1924. But with a new wife and baby to support, Squizzy was unreliable in making alimony payments and Lorna was still chasing him for arrears at the time of his death in 1927.